Since publishing her first book in the Hopkins' Adventures series, Jennifer has been quite busy promoting its success and introducing children around the East Tennessee area to her beloved friend's antics in story form. Her premier book has garnered much attention, including tv appearances, local radio and national podcast broadcasts, school, library, and store readings, as well as countless festival signings. 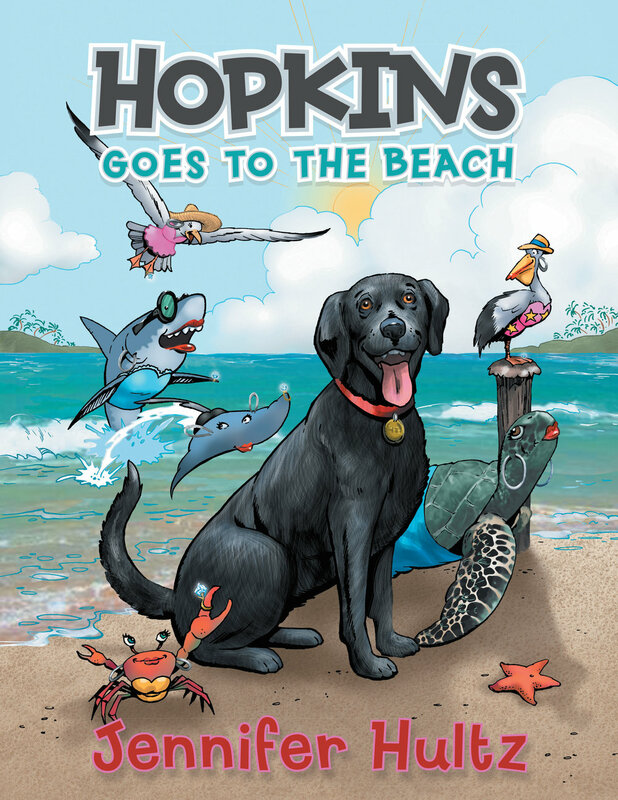 Hopkins Goes to the Beach is a children's story rooted in Jennifer's love of family, the beach, and her beloved black labrador, Hopkins. This book meets and exceeds even the highest of children's standards of what they love about books including incredible detailed, vivid, and colorful images on each page, rhyming, singsongy cadence to the storyline when read aloud, encouragement for children to use manners, and an important moral of the story: always listen to your mommy. Follow along with Hopkins as he explores this beautiful world we all call home. Next up, Hopkins Goes Camping, where he'll get an up close taste of the amazing warmth and zest of mountain life, specifically Knoxville's own Smoky Mountains. Currently, you can find "Hopkins Goes to the Beach" by Jenn Hultz at the following stores in Knoxville: Smart Toys & Books, Union Avenue Books, River Dog Bakery, Tennessee Pawz, Farragut Pharmacy, Barnes & Noble, Books a Million. Pick up your copy today! Jennifer Hultz grew up at the beach in Virginia and the Outer Banks of North Carolina. She spent weekends and summers enjoying all that its beauty had to offer. She is a lover of Labs and all things crafty. Jennifer currently lives in Knoxville, TN, with her husband, three beautiful children, and Polar Bear Lab, Smokey.